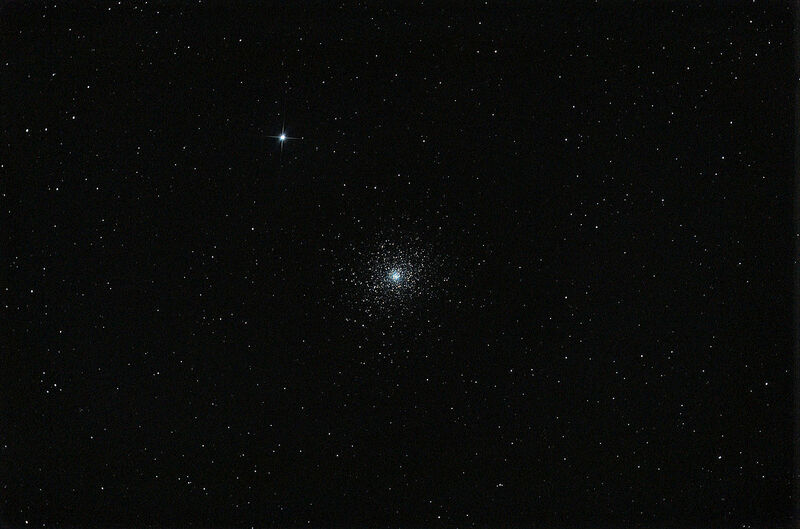 Messier 5 (M5) is a bright globular cluster located in the northern constellation Serpens. The cluster lies at a distance of 24,500 light years from Earth, in the galactic halo of the Milky Way. It has the designation NGC 5904 in the New General Catalogue. 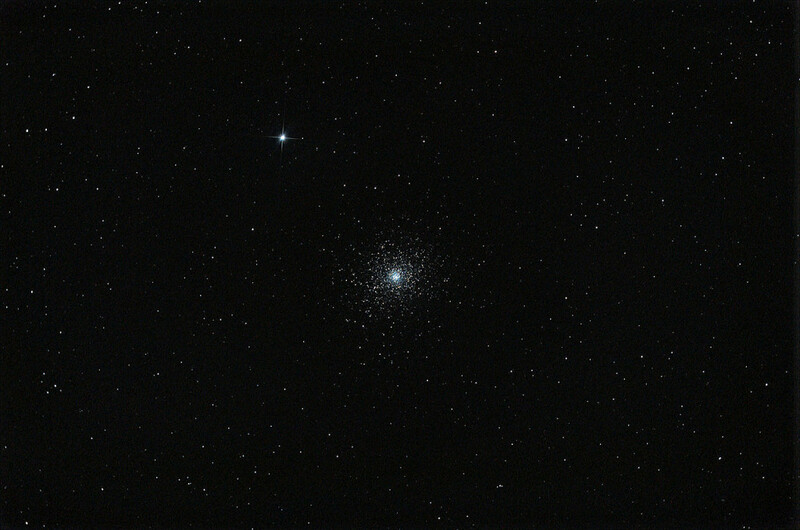 With an apparent magnitude of 6.65, Messier 5 can be seen without binoculars, but only under extremely dark skies and it only appears as a faint star near the star 5 Serpentis. Binoculars will reveal the object to not be a star, but a fuzzy patch of light, and small telescopes will show a bright glowing core. Individual stars will only appear in larger telescopes, starting with 4-inch instruments, which reveal the cluster’s brightest stars. The best time to observe M5 is in the months of March, April and May. The cluster can be found about a fist-width to the north of Zubeneschamali, the brightest star in the constellation Libra. It can also be found about two fist-widths to the southeast of Arcturus, the brightest star in Boötes constellation and fourth brightest star in the sky, or three fist-widths east of Spica, the brightest star in Virgo and the 15th brightest of all stars. Arcturus and Spica can easily be located by following the line formed by the three bright stars that mark the handle of the Big Dipper. The imaginary line leads first to Arcturus and then to Spica. 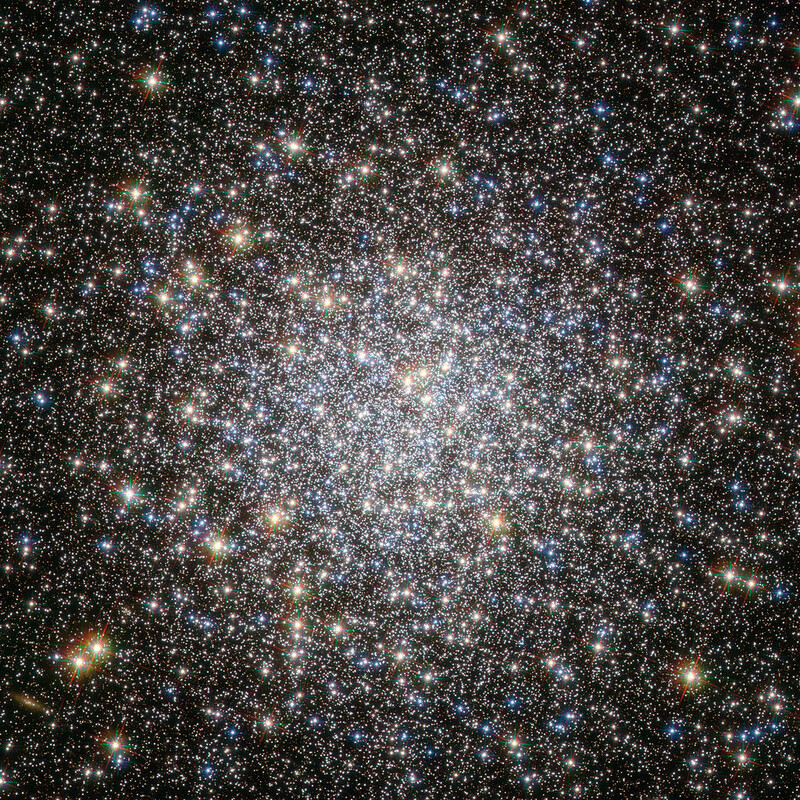 The globular cluster Messier 5, shown here in this NASA/ESA Hubble Space Telescope image, is one of the oldest belonging to the Milky Way. The majority of its stars formed more than 12 billion years ago, but there are some unexpected newcomers on the scene, adding some vitality to this aging population. Stars in globular clusters form in the same stellar nursery and grow old together. The most massive stars age quickly, exhausting their fuel supply in less than a million years, and end their lives in spectacular supernovae explosions. This process should have left the ancient cluster Messier 5 with only old, low-mass stars, which, as they have aged and cooled, have become red giants, while the oldest stars have evolved even further into blue horizontal branch stars. Yet astronomers have spotted many young, blue stars in this cluster, hiding amongst the much more luminous ancient stars. Astronomers think that these laggard youngsters, called blue stragglers, were created either by stellar collisions or by the transfer of mass between binary stars. Such events are easy to imagine in densely populated globular clusters, in which up to a few million stars are tightly packed together. Another way to locate the cluster is to find Arcturus and Antares, the brightest star in Scorpius. The cluster lies about 1/3 the distance between the two. It is located 23 degrees to the southeast of Arcturus. The slightly dimmer star Unukalhai, the brightest star in Serpens constellation, can also be used to find M5. 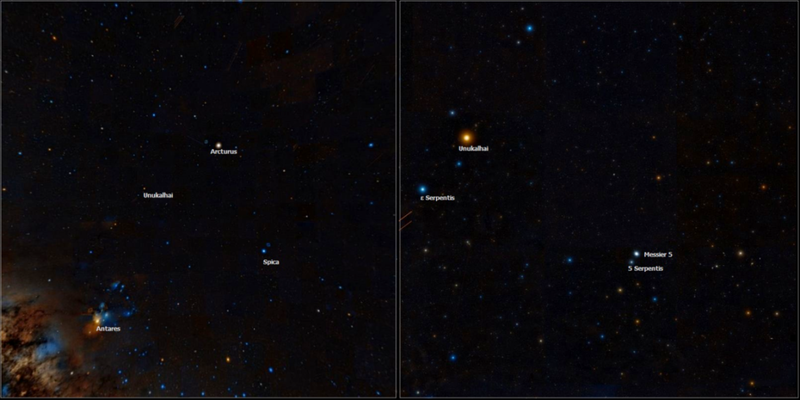 Unukalhai lies slightly to the left of the much brighter Arcturus and Spica. The faint star 5 Serpentis lies a few degrees from Unukalhai in the direction of Spica. M5 lies only half a degree away from 5 Serpentis. With a visual magnitude of 5.10, the faint white star is visible to the naked eye in good conditions. 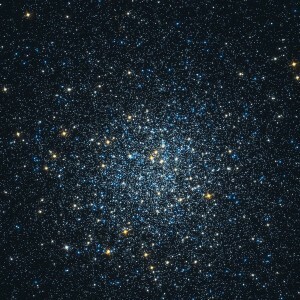 Messier 5 is one of the larger globular clusters known, spanning about 165 light years in diameter. The cluster has a tidal radius of 202 light years. Member stars are gravitationally bound to it within this space and can’t be torn away from the cluster by the gravitational pull of the Milky Way. The cluster has an ellipsoidal rather than spherical shape. It is receding from us at about 52 km/s. The compact core region is about 6 light years in diameter, corresponding to an angular size of 0.84′. Messier 5 was discovered by the German astronomer Gottfried Kirch on May 5, 1702 while observing a comet. He believed it was a star with nebulosity. The cluster was not resolved into individual stars until 1791, when William Herschel observed it in a larger telescope, a 40-foot focal length reflector, and counted about 200 stars. 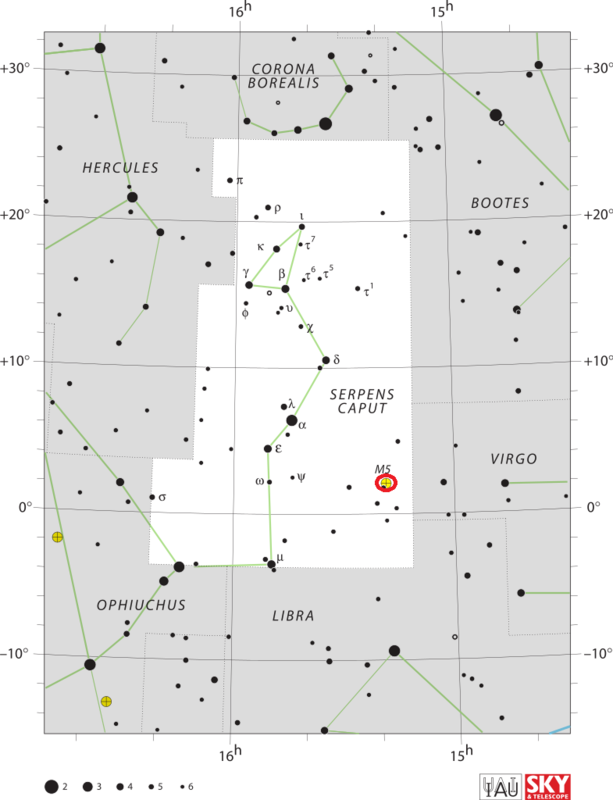 A close cluster of stars, over the beam of the Balance, in a narrow channel led into Serpens, and close to No. 5 of that asterism [5 Serpentis], which is double, and the next described [Smyth’s No. DXXXIX, 539]. This superb object is a noble mass, refreshing to the senses after searching for faint objects; with outliers in all directions, and a bright central blaze, which even exceeds 3 M. in concentration. Messier, who registered this in 1764, describes it as a beautiful round nebula, adding, “et je me suis assuré qu’elle ne contient aucune étoile [and I’m sure that it doesn’t contain any star].” This is curious, as the mass is so easily resolvable; though its laws of aggregation into so dense and compact a ball, are at present beyond reach. 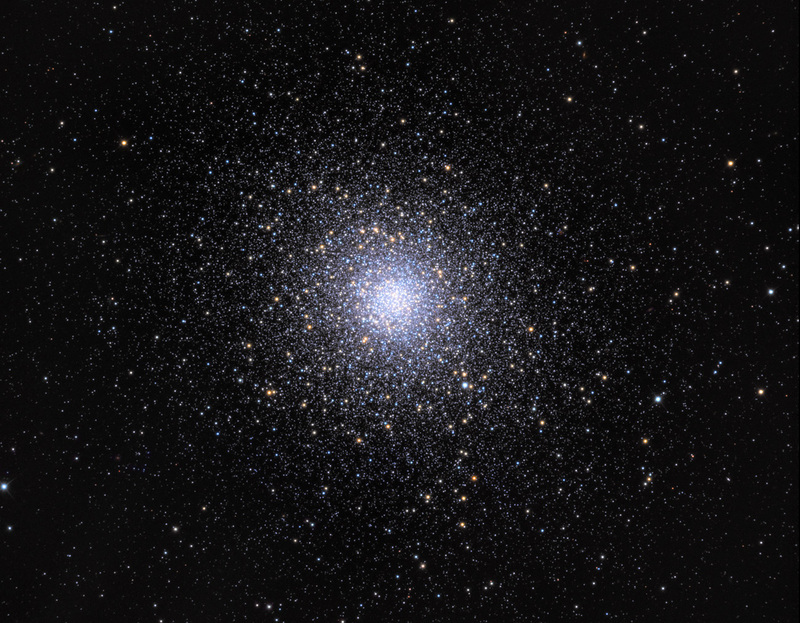 Messier 5 is home to more than 100,000 stars, as many as 500,000 according to some sources. The cluster’s overall spectral type is F7. The brightest stars in M5 are of magnitude 12.2. The cluster contains at least 105 variable stars, of which 97 are of the RR Lyrae type and can be used to measure distances in outer space. The first variables in M5 were discovered by the English amateur astronomer Andrew Ainslie Common in 1890. American astronomer Solon Irving Bailey later found 85 RR Lyrae variables in the cluster. M5 also has a significant number of blue stragglers, old stars that appear younger and bluer than they should be, likely as a result of interaction with other stars. Astronomers have also observed a dwarf nova in M5, a type of cataclysmic variable star that consists of a close binary system in which one of the stars is a white dwarf that accretes matter from its binary companion. As a result, the white dwarf exhibits periodic outbursts. 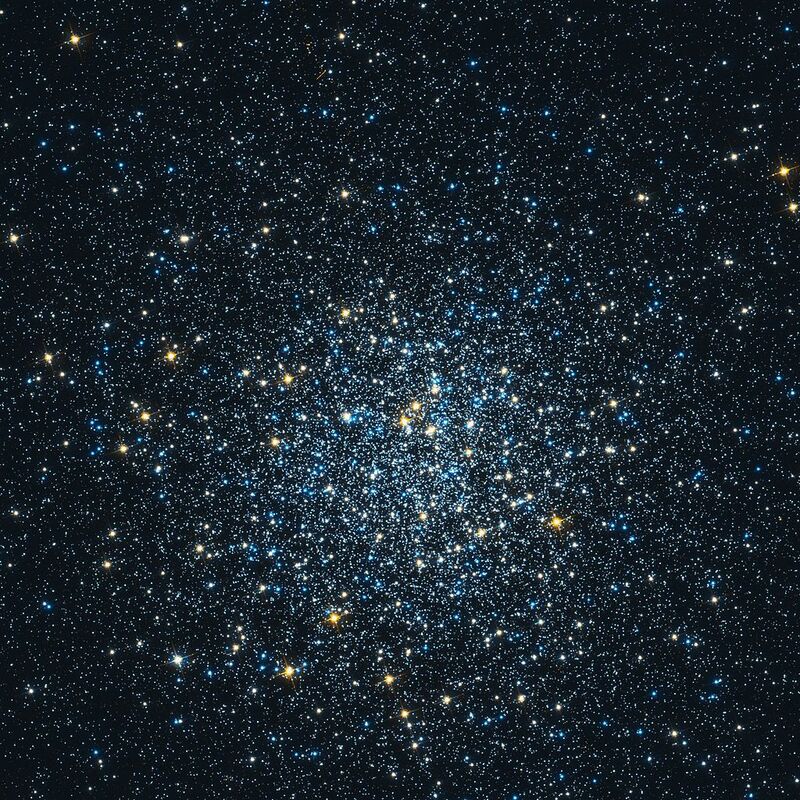 The estimated age of M5 is 13 billion years, making it one of the older known globular clusters associated with our galaxy. In 1997, two milisecond pulsars were discovered in the cluster.